We left Punakha and drove to Wangdue Phodrang. After about 30 minutes the Wangdue Phodrang Dzong came into view on a hill across the river. We drove over the river bridge and up the hill. Before reaching the main village centre we passed through a line of traditional wooden houses and shops built along the road side with their backs dangling on the edge of a cliff. 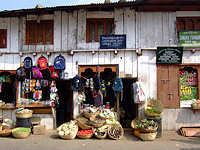 These old houses and shops posess an air of tradition and local lifestyle untouched and unchanged by modern life. They look lovely but I was told that unfortunately these charming old houses and shops may be demolished soon due to road safety concerns. We reached the market square. It was a lively and unspoilt little town, but as it was lunchtime our first stop was at the restaurant of the Hotel Tashiling for our lunch. This turned out to be the best meal of our Bhutan trip. We had lentil soup, spicy chicken, crispy fried beans, fish portions, creamy potatoes 'au gratin', freshly cooked mixed vegetables and rice. Of course we washed all this down with our favourite Druk beer. After lunch we visited Wangdue Phodrang Dzong. 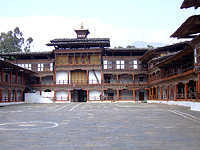 This Dzong is perhaps less imposing than others that we visited. It is old and shows its age but this adds to the feel of antiquity about the whole place. It was also rather quiet with few visitors around. It was a pity that the temple was closed to visitors that day, making us wonder what was behind the imposing golden door. Before we left Wangdue village we decided to walk around the market square and see all the houses and shops along the cliff edge road. This turned out to be a most enjoyable walk. 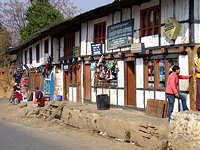 The village square is lined with little local shops on one side and market sellers on the other side. Suddenly we were surrounded by a group of young schoolboys. They were interested in what we were looking at and Rob’s camera. I decided to give them a small bag of nuts each from the shop. It was grasped from my hand so quickly that the four bags of nuts flew out of my palm. I ended up with two extra bags to give to their waving excited hands. They were so happy and speaking in English too. I walked to another shop and brought another bag, this time of chocolate. They lined up four in a row and said thank you and bye bye as we walked to our car and drove away. I waved at them from my car window. We drove back to Punakha. As it was still early we went back to Punakha Dzong for the rest of the festival. There were still many people there although the festival was down to the last dances of the day. I found the same seat that I had that morning on the steps to the VIP guest balcony. 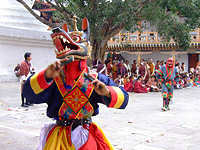 The last dance began with three animal mask dancers. Starting in the centre of the square jumping and dancing, after a while the first dancer in a blue top began heading toward the Chief Monk's balcony steps, where I was sitting. It was quite scary with his mask coming so near me. He passed me onto the steps up to the balcony. The second dancer in red top was to follow the same move to the second floor. Finally the third dancer in orange top was the last to finish the dance and leave. It was the end of the festival show. It was the most exciting festival I have ever been to. It was also the most happy event and I have enjoyed it so much. 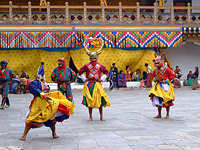 It was also the most beautiful setting as well as the most beautiful and colourful costumes that I have seen for a long time. It was magical. We took a lingering look at the Punakha Dzong again before we drove back to hotel. I knew we were leaving next day for Paro.